2.1 Where we opt for RTOS? 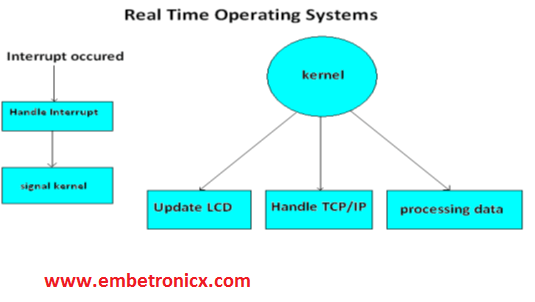 In Real Time Operating Systems, each activity set as its own task which runs independently under the supervision of the kernel. For example in Fig 1.5, one task update the screen, another task is handled the communications (TCP/IP) and other one processor the data. All these three task runs under the supervision of kernel. When an interrupt is occurred from a external source, the interrupt handler handles that particular interrupt and pass the information to the appropriate task by making a call to the kernel. Where we opt for RTOS? An RTOS is really needed to simplify the code and make it more robust. For example if the system has to accept inputs from multiple sources and handle various outputs and also doing some sort of calculations or processing an RTOS make lot of sense. RTOS can run multiple independent activities. Support Complex communication Protocols (TCP/TI. I2c, CAN, USB etc..). These protocols come with RTOS as library provided by the RTOS vendors. It stores these details in it. To schedule a task, three techniques are adapted. Co-operative scheduling: In this scheme, a task runs, until it completes its execution. Preemptive Scheduling: This scheduling scheme includes priority dependent time allocation. Usually in programs, 256 priority level is generally used. Each task is assigned an unique priority level. While some system may support more priority levels, and multiple tasks may have same priorities. Process of storing and restoring the state of a process or thread while changing one task to another. so that execution can be resumed from the same point at a later time. Context switching is the mechanism by which an OS can take a running process, save its state and bring another process into execution. It does this by saving the process “context” and restoring the context of the next process in line to the CPU. Preemption is when a process is taken off the CPU because a higher-priority process needs to run. Context switching is when the memory map and registers are changed. Context switching happens whenever the process changes, which may happen because of preemption, but also for other reasons: the process blocks, its quantum runs out, etc. Context switching also happens when a process makes a system call or an interrupt or fault is serviced. So preemption requires a context switch, but not all context switches are due to preemption. A semaphore (sometimes called a semaphore token) is a kernel object that one or more threads of execution can acquire or release for the purposes of synchronization or mutual exclusion. They are shared among all tasks that need them. Making the semaphore a global resource allows any task to release it, even if the task did not initially acquire it? one or more protocols for avoiding problems inherent to mutual exclusion. Priority inversion occurs when a higher priority task is blocked and is waiting for a resource being used by a lower priority task, which has itself been preempted by an unrelated medium‐ priority task. In this situation, the higher priority task’s priority level has effectively been inverted to the lower priority task’s level. Apply to the task that owns the mutex. It ensures that the priority level of the lower priority task that has acquired the mutex is raised to that of the higher priority task that has requested the mutex when inversion happens. The priority of the raised task is lowered to its original value after the task releases the mutex that the higher priority task requires. It ensures that the priority level of the task that acquires the mutex is automatically set to the highest priority of all possible tasks that might request that mutex when it is first acquired until it is released. Consider the standard producer-consumer problem. Assume, we have a buffer of 4096 byte length. A producer thread collects the data and writes it to the buffer. A consumer thread processes the collected data from the buffer. Objective is, both the threads should not run at the same time. A mutex provides mutual exclusion, either producer or consumer can have the key (mutex) and proceed with their work. As long as the buffer is filled by producer, the consumer needs to wait, and vice versa. At any point of time, only one thread can work with theentire The concept can be generalized using semaphore. A semaphore is a generalized mutex. In lieu of single buffer, we can split the 4 KB buffer into four 1 KB buffers (identical resources). A semaphore can be associated with these four buffers. The consumer and producer can work on different buffers at the same time. Strictly speaking, a mutex is locking mechanism used to synchronize access to a resource. Only one task (can be a thread or process based on OS abstraction) can acquire the mutex. It means there is ownership associated with mutex, and only the owner can release the lock (mutex). Semaphore is signaling mechanism (“I am done, you can carry on” kind of signal). For example, if you are listening songs (assume it as one task) on your mobile and at the same time your friend calls you, an interrupt is triggered upon which an interrupt service routine (ISR) signals the call processing task to wakeup.